A photojournalist in visit to post-war Vietnam realizes the Government is covering up poverty and hardship. Often considered the final instalment of an unofficial “Trilogy of Vietnam” and following “The Boy From Vietnam” (1978, for television) and “The Story of Woo Viet” (1981), Boat People goes to Vietnam in search of the reasons behind the diaspora that started in the late 70s, following the defeat of South Vietnam and that director Ann Hui had examined in the previous two movies. 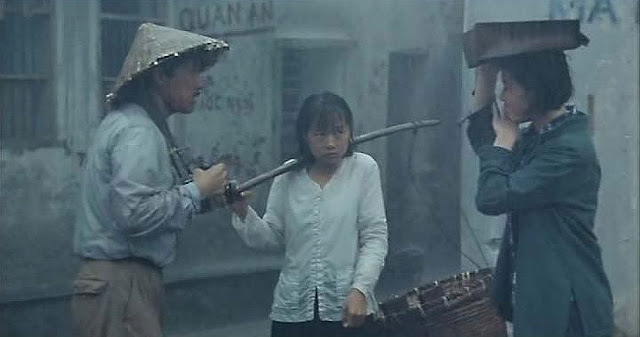 Boat People was presented in Cannes in 1983 where, due to the connections France-Vietnam, was removed from the Official Competition and relegated to “Surprise Film” and what a surprise it was! The film caused a stir and for a long time after has been misread as a strong anti-Communist statement. "Boat People" will screen at Five Flavours, that will be on in Warsaw November 15-22. The movie is narrated through the perspective of the central character, a photo reporter from Japan, called Akutagawa (George Lam). It’s him that we spot at the very beginning of the film, frantically photo shooting the military parade entering Danang in a precise time in history, the Communist victory over South Vietnam and its American allies in 1975. Three years later Akusagawa is back to Vietnam, as a guest and friend of the Cultural Bureau and is chaperoned around to witness the economic growth and the happiness of the population under the new regime. Pride and joy of the Government is a New Economic Zone where Akusagawa is taken on a propaganda tour and where is shown happy people, well-fed children and great improvements. Back to Danang and eager to follow his photographic inspiration instead of the Government guidelines the journalist manages to roam free in the city looking for spontaneous subjects to shoot and slowly starts to realize that there is more to it than the happy children singing hymns to Chairman Ho. Reality checks in when he befriends a family of local scoundrels and start following them in their errands, just to discover how poor the ordinary people are and how arduous getting by has become for them. Increasingly concerned for the life condition of his new little friends, especially the 14-year-old Cam Nuong (Season Ma) and her little brother, the reporter starts to consider helping them. At the same time, he is determined to discover more about the New Economic Zones and when he finally revisits them with laborer/prisoner To Minh (Andy Lau) instead of the indoctrinating tour guides, the reality is so appalling to make him think escape is the only way to offer hope and future to his young friends. Unsurprisingly “Boat People” has been the center of endless discussions, exploited by one side or the other according to the occasional need and frankly the dramatic rendering of the post-war Vietnamese Communism is truly affecting but we must not forget this is an Ann Hui’s movie and that consequently the focus and the perspective are on the ordinary people and their lives in a tragic and extraordinary moment in history. However, we cannot deny that, through another country’s history, the director has channeled the anxiety for the future that Hong Kong was experiencing at that time, the malaise of uncertainty as the handover was casting its shadow, the so-called China Syndrome. Shot on Hinan Island, Mainland China, it features carefully reconstructed houses, markets and costumes and despite the realistic representation of social problems the direction and editing are dynamic and far from documentary style. Ann Hui had carried out countless interviews to refugees for her previous Vietnam movies and she uses them to enrich the script with subplots and profoundly humane characters such as the charismatic “Madame” (Cora Miao) and the disenchanted and decadent Comrade Nguyem (Qimeng Shi). While George Lam’s performance is compassionate but at the same time provides a little relief above the misery, Andy Lau in an early role is an explosive mix of youth, passion and drama and interestingly in the first draft of the script he was intended to be the point-of-view character. Ann Hui has merged social issues, melodrama, conspiracy and great humanity in Boat People with her hallmark flair and has created a transnational classic that reaches out to our time and our hearts.